After six years honing his skills in kitchens in Paris and Marseille, up-and-coming culinary star Wallace Mua, 31, has taken up the reins as Executive Chef at Auckland's FISH restaurant. 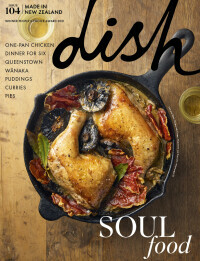 He talks to dish about food, France and bringing a Pacific flavour to fine cuisine. What inspired your love of cooking? Inspiration started from early on in my life: Big Isand families have big Island gatherings, and each extended family would bring their own dishes to put together this incredible feast. It amazes me now that they seem to know exactly how much to cater for without even knowing exactly how many will be attending. My inspiration would have to be the women in my family; they are fierce and unforgiving in the kitchen, I learnt a lot from them, I also learnt a lot from all the chefs I have worked for in the past, especially [dish columnist and executive chef of Nourish Group] Gareth Stewart and Chris Law. When did you decide you wanted to be a chef and why? I was about 15, working as a kitchen-hand. I loved the military way the kitchen ran. The chefs had an aura - the sometimes loud egoism or the quiet confidence, or the passionate hunger of chasing the unreachable perfection but still coming in every day and trying. You have Samoan heritage… did you eat a lot of Samoan dishes growing up, or was it mainly traditional Kiwi fare? It was mostly Samoan at home, but I grew up in a multi-national neighbourhood where everyone looked out for each other. I would get Cook Island-style food from across the road, Tongan from one neighbour, and Chinese or Indian – and every now and then some good hangi - from others. How do you bring your Pacific influence into your cooking? By using the ingredients synonymous with Polynesian food. I would love to go the traditional method of cooking (earth oven), but it is a bit complicated in a commercial kitchen. You’ve just spent six years in French kitchens… whereabouts in France were you? How was the experience, and what was the most valuable thing you learned? I spent a bit of time in Paris but the bulk of time was in Marseille. The experience was an eye-opener, it gave me a lot of confidence in myself. One of the most valuable things I learned was their loyalty to their traditions, it gave me a reason to look at a more modern way [of cooking] but still paying homage to their traditional ways. I can definitely hold my own in a conversation, though I still have grammatical errors that my [French] wife likes to point out. It was a challenge, especially when the chef was calling the dockets out in French (and he wasn’t a fan of repeating himself), but like anything it got easier. Does Samoan cuisine marry well with French cuisine? It really depends; each region in France has their own specialty, so it can work for certain things. One example for myself was making a classical rouille but replacing the potato with taro. Or by changing around a few ingredients you can turn a fish carpaccio into re-visited Polynesian oka. What is your go-to meal when you are short on time? Corned beef and rice - maximum 10 minutes and you’re eating. Raw fish with lemon juice with green bananas. Or simply scrambled eggs on toast. What advice would you give to a young person with their sights set on becoming a chef? Be a sponge. Many of my old chefs used to say read and also note down all the recipes you learn over the years. It took me a while to realise but that was some of the best advice I received as a younger chef. The amount of times I wanted to do something new using an element of something in an old dish but couldn’t recall the exact recipe. It makes me kick myself! What are your top five pantry staples? Olive oil, mixed herbs, fish sauce or soy sauce, curry powder, potato flour. a) Cibo, b) Frasers c) GoGo Café or Spicy House. What was your last truly memorable dining experience? It was actually in France. We stumbled on a little place called L’Arôme in a really bohemian type district in Marseille called Cours Julien. I had a veal cromesquis for entrée, crab and mackerel for main, and a Briton sable with strawberries. It was so simple but so expertly executed that to this day I always recommend it to people. Definitely a better chef, a better father, a better person. Here in Aotearoa we are proud of our Maori and Pacific cultures, yet this doesn’t seem to translate to eateries. Although they’re increasing you don’t, for example, hear a lot about Maori/Samoan/Tongan etc restaurants… Why do you think that is? There are good eateries and always have been but they are usually tucked in Polynesian populated areas like South Auckland. Polynesian food has no hidden flavours - there is no searching because you know what you are eating. Trying to fuse those flavours is a tough job. It has been something I have been trying to do for years. The problem is by adding herbs and spices you risk losing what gives it that ‘Pacificness’, which is eating the soul of the food, where the bulk of the flavour comes from the key ingredients and at most ginger, garlic and soy sauce. The late Paul Bocuse for his expertise, probably Morgan Freeman because I assume he would give honest feedback, a young Winston Churchill for the ambience, and of course Bob Marley because I am a big fan. What would you tell your 18-year-old self about being a chef, and life in general? Once you’re comfortable, force yourself to get uncomfortable. For more, take a look at their website here.